Just Piano Stools for the widest choice of quality piano stools. UK postage is included in the price. These Tozer solo piano stools are available to order. Please allow up to six weeks for delivery. The Tozer 5016 solo piano stool features music storage with tapered legs. Available in satin or gloss finish. The seat is available in vinyl, dralon or leather in a range of colours. 57cm wide, 33cm deep and 51cm high. Buying a piano stool with storage is a good idea as you can never have too much room to store all of those important music books, notes and pieces of sheet music. Under-seat storage means they can be kept to hand safely but out of sight. The Tozer solo 5016 and duet 5016d along with the solo 5092s piano stools all provide music storage. Duet piano stools also provide greater storage as well as allowing for two players. 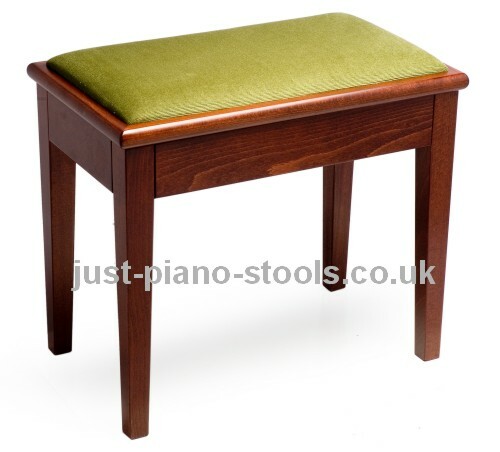 Woodhouse have over a dozen different designs of piano stool with storage. For extra deep storage see our box piano stools. These piano stools with storage are manufactured by Tozer and are made to order. Please allow six weeks for delivery of your new piano stool.